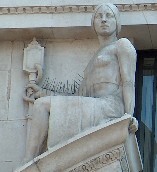 HW Palliser was one of the sculptors who started his art training in an Edwardian world, spent most of his career in the 20th Century, and while producing work in an art deco style, kept something of earlier artistic sympathies. He was born in Northallerton in 1888, and studied at the Central School of Arts and Crafts, and then at the Slade under J. Havard Thomas. 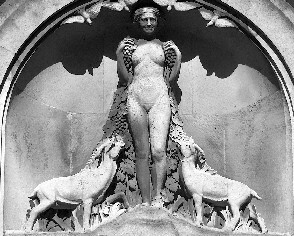 There are three main works of architectural sculpture by him in central London, all in stone. In King William Street, in the City, is what is now a Russian bank, but was once the London Life Association, with three pairs of figures of seated figures, male and female (other sculptural work on this building is by C. L. Hartwell). 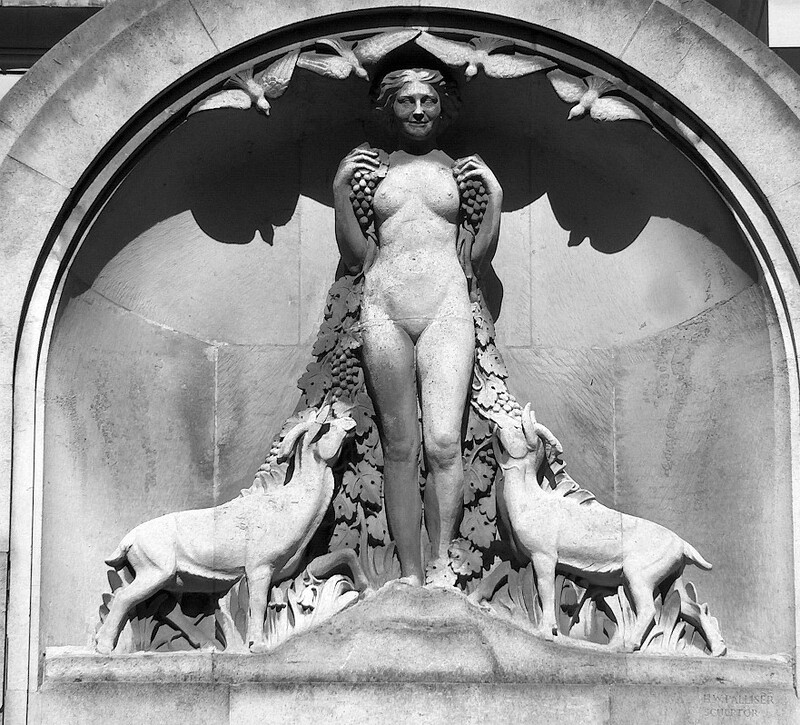 On the north side of Southwark Bridge, close to Cannon Street, is Vintners Place, with woman representative of the spirit of the grape harvest, flanked by two goats and with doves above her head, and swans on the supporting blocks – a strange thing. Most ambitious, and unfortunately most difficult to see because it is high up in a road too narrow to get the proper distance, is the pediment group for a large building called Victoria House facing Southampton Row – it consists of three figures with machinery. Fortunately, the pediment on the other face of the building, towards Bloomsbury Square, can be seen at a comfortable distance - pictures of both works are on the Bloomsbury Square page. Among his other work, though I have not been to see it, are stations of the cross and a font for Kenton Church, Harrow. Palliser’s central London works are in the tradition prevailing from after WW1 which led to the art deco style in the 1930s. His men are muscular, square shouldered, and with close-cropped hair. His girls have a deco hardness of expression, shortish hair close to the scalp, lithe rather than full figures, and again a certain muscularity to arm and leg. Clothes, where present, are sparely classical. The Vintners Place statue is rather more rounded in form which would reflect its rather earlier date.